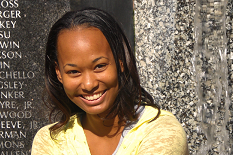 Congratulations to Nikesha Davis, Aerospace Engineering Ph.D. student, for receiving the National Science Foundation's Louis Stokes Alliance for Minority Participation (LSAMP) Bridge to the Doctorate Fellowship for the 2008-2009 and 2009-2010 academic year. Nikesha?s research interests include dynamics and control, aerodynamics, and rotorcraft systems. Her faculty advisor is Dr. Inderjit Chopra. Nikesha Davis is originally from Upper Marlboro, MD. She received her B.S. from Spelman College in General Science and Mathematics, along with a B.S.E. in Mechanical and Aerospace Engineering from the University of Alabama in Huntsville in 2006. After obtaining her Bachelors degrees, she also received her Masters in Systems Engineering with a minor in Aerospace Engineering from the University of Alabama in Huntsville in 2008. Nikesha is currently a first year PhD student in the Aerospace Engineering Department working under Dr. Inderjit Chopra. Her research interests include Dynamics and Control, Aerodynamics, and Rotorcraft systems.